The Knik-Fairview Planning area, the same region as the Knik-Fairview Community Council area,is somewhat unusual in the borough in that it includes two distinctly different populations in the same planning area and community council area. The northern section of the planning area is functionally a suburb of Wasilla and Anchorage. In contrast, the Knik area has historically been and is still considered by many of its residents to be its own community. The Planning Team acknowleges the social and political differences of the two populations. The socio-economic differences in the two areas include household income and commute patterns. Census data indicates that many more residents of the northern area commute out of the borough than in the southern area. Census information also indicates a fairly dramatic difference in the blocks, the Knik and Pt. MacKenzie areas. The southern planning area includes portions of two census blocks, The Knik and Pt Mackenzie areas, which together have an average household income half that of the census blocks to the north. Other differences include a 10% older median age in the Knik census block that the average of the remaining planning are and a smaller household income half that of the census blocks to the north. While this data indicates a difference in the populations, it does not adequately express the different identities of the people in the Knik region. The Knik Community faces less development pressure than the northern planning area. Furthermore there is a more resourceful attitude amongst the many residents of the Knik area. Although difficult to quantify or substantiate, the planning team and planning staff perceive a difference in attitude toward land use regulations from the residents in the south as opposed to those in the north. In general, the perception is that the Knik area residents would prefer fewer protective land use regulations than use regulations most often were from the northern planning area. Because the Knik area appears to be facing less development pressure and there appears to be less desire among residents in the Knik area for land use regulation, the Planning Team has recommended less restrictive land use regulations in the southern planning area than the northern planning area. Specifically, certain regulations proposed for the rest of the planning area should be excluded from the Knik District. The Knik District should have more permissive land use regulations in keeping with the desires of the residents and the more remote and rural location. Commercial businesses should not be restricted within the Knik District. Heavy and light industrial uses should be conditionally permitted with in the Knik District. One of the defining elements of the Knik community is the prevalence of dog mushing activity. The area around Knik has a long history and tradition of dog mushing, the white settlement of the Knik townsite was a freight hauling station to the goldfields of Nome. Dogsleds were used extensively during this period. More recently the use of dog sleds has been kept alive through recreational dog mushing. Within a two mile radious of Knik there are more than 25 dog lots and an excess of 1800 dogs. The area includes the Knik museum and dog mushers Hall of Fame, The Historic Iditrarod Trail and several commercial tourist oriented mushing operations offering guided dogsled trips. Dog mushing is one of the few commercial industries within the Knik area. Historical use and acceptance of dog-mushing and dog lots. prevalence of other knowlegeable mushers and availability of experienced help. Dog lots and dog mushing should be preserved as a legal use in the Knik District. Although the area has a long history of mushing it is acknowledged that most current and future residents of the area are not likely to be mushers. A minimum of regulations need to exist within this district and the remaining planning area to minimize the impacts of dog lots to adjacent residents. These impacts are in descending order of importance/ annoyance;noise, visual blight, odor, damage to water quality, environmental damage to soils and vegetation. There should be a larger minimum lot size to two acres within the Mushing district to maintain land base of suitably sized lots for dog mushing and to alleviate land use conflicts. The previous recommendation would help to minimize land use conflicts between mushers and neighboring land owners. The minimum lot size will help keep the overall residential density low( reduce the potential for land us conflicts), allow mushers to located their kennel away from their neighbor's lot line and allow non-mushing residents to site their homes away from lot lines and dog lots. Also, given the proposed minimal regulation for the Knik district, the large lot size will also alleviate some of the conflicts that might otherwise occur in the denser population with no seperation of commercial and residential land uses. Those wishing to develop dog lots outside of the Knik District should be required to have a minimum size five acre lot. Dog lots will only be allowed as an accessory use to a principle residential use outside of the Knik District. Dog density should be regulated to prevent in humane overdcrowded and environmentally damaging conditions. With is the Knik District the density should be no more than an average of 25 dogs per acre. For areas outside the Knik District the maximum density should be 10 dogs per acre. The planning area north of the Knik district has more developent and , on average higher density development than the Knik area. The region is likely to continue developing in the manner largely due to the influence of Anchorage. Few dog lots exist in the northern portion the planning area. The northern area has almost no publice lands( other than the palmer hay flats which mushers find unsuitable for their needs.) The planning team recognizes that many of the mushers are scrupulously conscientious of their neighbors, however others are unable to effectively minimize the negative odor, audible and visual impacts of a large number of dogs confined to a relatively small area. the planning team desires to maintaning the residential qualities that have drawn its residents to the northern planning area and recommends that dog lots north of the Knik District be sited on lots no less than 5 acres in size. The large lot size will mitigate some of the negative impacts that accompany some, but not all,dog lots. Furthermore, by allowing dog lots only as an accessory use to a principle residential use the landowner will have and inherent incentive to maintain the dog lot in a manner compatible with residential development. The setbacks and buffers will prevent mushers from location their dog lots as close as possible to their neighbor and provide some visual and audible relief to adjacent landowners. The dog density requirement is intended ot allevieate some of these impacts to neighboring property owners and minimize environmental damage. Another issue of importance to mushers and surrounding landowners alike is access to trails. Many mushers harness their dogs and leave their property via dogsled. Legal access to mushing trails is a necessary amenity if the mushers are to avoid trespassing . 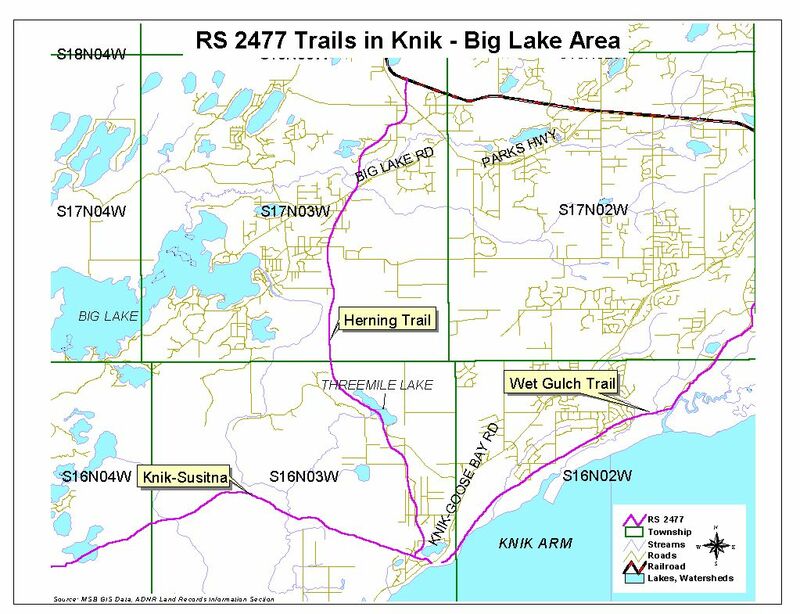 This is likely to become a bigger problem as the Knik areas population grows and the private lands which are currently being used for trails are developed. Reserving trail right of ways during the subdivision process is critical to maintaining the traditional heritage of the Knik area as a dog mushing center. Sufficient legal trails need to be established and the trail right of ways need to be preserved to support dog mushing and other recreational uses. Subdividers should be encouraged to develop lots backing upon trails and dedicate trail rights of ways where appropriate. The availablity of legal trails will help reduce the current trespass problems by giving mushers and recreational users adequate access to public lands through predominatly privately owned areas.